New Mexico’s state bird, the roadrunner, is the basis of the famous cartoon character Road Runner, a bird that uses his speed and cunning to outmaneuver his antagonist, Wile E. Coyote. As I kid, I loved watching Road Runner and Wile. E. Coyote cartoons on Saturday mornings. From a travel perspective, Wile. E Coyote taught me a valuable lesson; poor planning trumps intelligence every time. 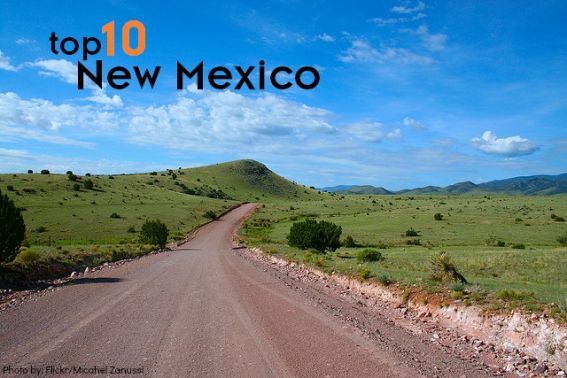 If you’re planning a family vacation to The Land of Enchantment, read Trekaroo’s top 10 things for families to do in New Mexico before you hit the ground running. Meep Meep! New Mexico Dude Ranches and Resorts offer guests a chance to experience the cowboy life.Bishop’s Lodge Ranch Resort & Spa offers daily rides for children 7 and under; little Buckaroos receive a bandanna, cowboy hat and sheriff’s badge as a keepsake. Roadrunner Tours offer family overnight trips with dinner, breakfast and camping gear included. Hyatt Regency Tamayahelps families get the most out of their visits through its Srai-Wi (My Children) family program. Children ages four through eight will have great fun riding a horse while friendly handlers guide them safely around the stables corral. 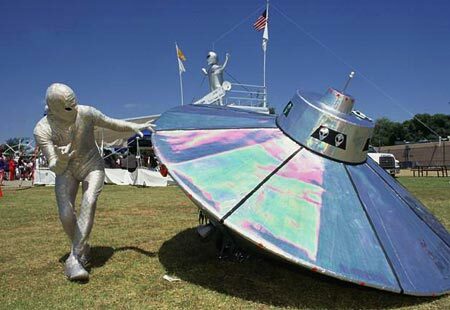 Celebrate the intrigue of the 1947 Roswell incident with UFOlogists, an alien costume contest, a motorcycle rally, fireworks, and an air show at the Roswell UFO Festival. If you get tired of all thealiens encounters, you might want to appreciate Earth’s creatures at Roswell Spring River Zoo. Located in beautiful Spring River Park, this zoo features both native and exotic animals, a miniature train, and an antique wooden horse carousel (this rare treasure is one of about a hundred left in the country.) Best of all, admission is free and rides are only a quarter each! The Robert H. Goddard Planetarium presents a variety of free shows for both children and adults featuring the constellations, planets, and other celestial sights on a regular basis. 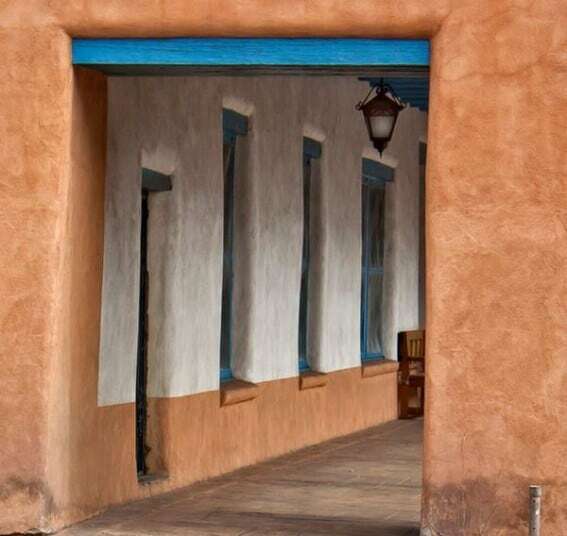 About 75 miles north of Santa Fe, the city of Taos has plenty to offer families. 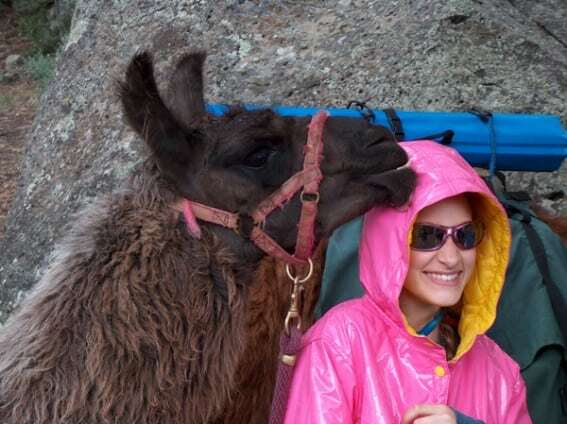 Wild Earth Llama Adventures offers “Take a Llama to Lunch” one-day hikes or three-day special Family Wilderness Adventure llama camping trips. Each family adventure is custom designed both prior to the trek and in the field. Wild Earth Llama Adventures wants young people’s early hiking and camping experiences to be fun and educational, not traumatic. They will even work with you to plan a menu that your whole family will love! For my family this means one of the llamas will carry a McDonald’s on his back during our trek. Kids, camping, and llamas are a winning combination. Afterwards, swing by Twirl Toystore and Playspace, a magical children’s activity center and toy store. The free outdoor play area is amazing. There are multiple slides and climbing objects, musical instruments, a sandbox, a tree house, rolling toys, and much more! Find a spot to rest your head in Taos, New Mexico. Albuquerque is a town full of “not to miss sights.” Explora Science Center and Children’s Museum combines the best of science and pure kid’s museum fun. 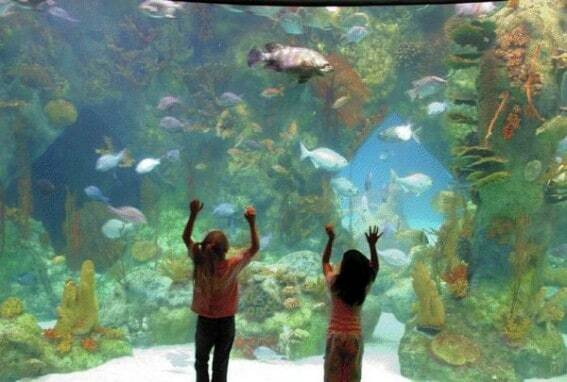 The ABQ BioPark is comprised of Rio Grande Zoo, Botanic Garden, Tingley Beach and the Aquarium. At Aquarium Overnight, parents and children sleep next to the sharks!! Do not miss First Friday Fractals at the beginning of the month at The New Mexico Museum of Natural History & Science. First Friday Fractals is the spectacular, award-winning full dome planetarium show that takes viewers on a tour of the fractals in nature. Petroglyph National Monument is Albuquerque’s not to miss outdoor activity. Take a hike, enjoy the beautiful sunset, and examine the estimated 24,000 carved images residing here. Read reviews of The New Mexico Museum of Natural History & Science. 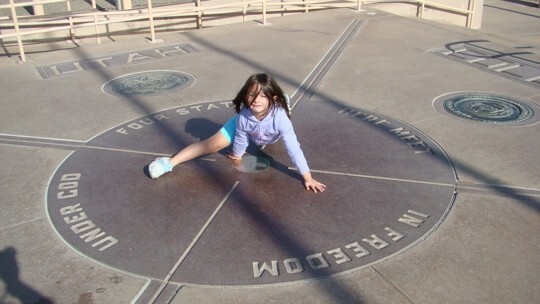 Four Corners Monument marks the quadripoint where the states of Arizona, Colorado, New Mexico and Utah meet. It’s the only point in the United States shared by four states. I love planking, I love state lines, nuff said. New Mexico’s other natural wonders include tent rocks atKasha-Katuwe Tent Rocks National Monument, Bandelier National Monument, and Clayton Lake State Park. Tent Rocks National Monument includes a recreational trail which provides opportunities for kid friendly hiking and great views. Bandelier National Monument offers up close views to ancient cliff dwellings and 11,000 year old petroglyphs. In the northeastern corner of New Mexico, a bonanza of dinosaur tracks are preserved in sandstones dated at about 100 million years old. Today, the tracksite, with over five hundred preserved dinosaur footprints, is one of the main attractions at Clayton Lake State Park and one of the best-preserved and most extensive dinosaur tracksites in the United States. Read Trekaroo reviews of Bandelier National Monument. What’s a visit to New Mexico without a rodeo? In early summer, kids can join in on the crazy fun at Rodeo de Santa Fe. This traditional old-time rodeo features a parade and kids’ events such as “mutton busting” (little ones ride a sheep) and a hilarious calf scramble (kids try to catch a calf for a prize.) At the Santa Fe Childrens Museum kids learn water conservation and ecosystems through interactive exhibits. El Rancho de las Golondrinas (The Ranch of the Swallows), is a ranch turned living museum that recreates 18th Century Spanish colonial ranch life. Guides are dressed in period clothing and demonstrate how people once lived. Live music and street performers at the Santa Fe Farmers Market will keep your kids dancing in the streets and begging for treats. 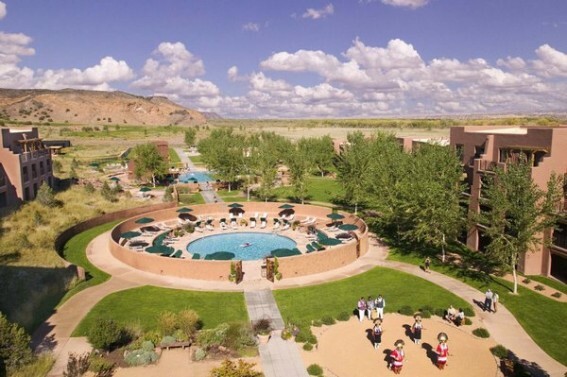 Consider a stay at Rosewood Inn of The Anasazi which offers Rose Buds for Children, a program designed just for kids. Sante Fe is full of fun! Head here for the best of Sante Fe’s activities. Take to the sky for the ride of your life. With all of the ballooning activity in New Mexico you have several balloon ride companies to choose from; Santa Fe Balloons picks up passengers at local Santa Fe hotels about 30 minutes before sunrise. From Albuquerque, Rainbow Ryders offers families the chance to drift over the Rio Grande Gorge. Afterwards, enjoy a champagne breakfast. What could be more exciting than that? How about 600 hot air balloon rides launching all at once? The Albuquerque International Balloon Fiesta is a world-renowned attraction and destination for kids of all ages. For more than three decades, the first week in October brings once in a lifetime photo opportunities as hundreds of hot air balloons sail silently through the crisp fall air. Besides the balloons, there are bands, children’s acts, fireworks shows, and interactive education at the Balloon Discovery Center. 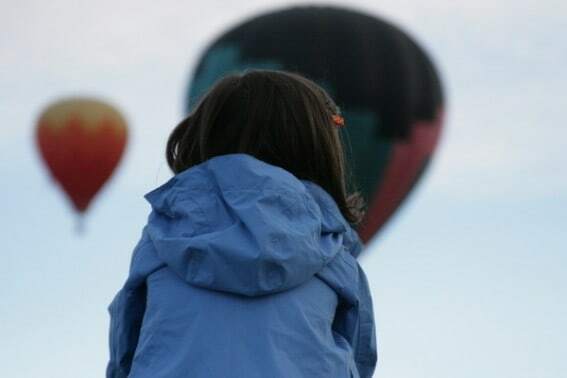 Been hot air ballooning with your kids? Share your scoop! 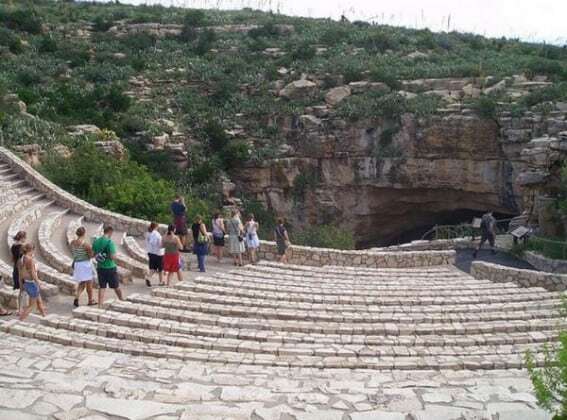 Read Trekaroo reviews of Carlsbad Caverns National Park. 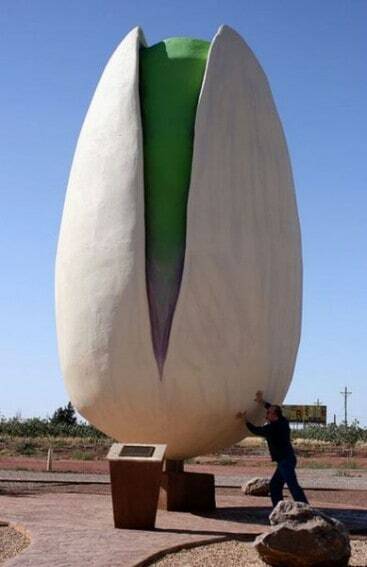 The fun never ends when you’re striking poses for the camera in front of the world’s largest pistachio! Whether you’re a lover of pistachios or just a lover of large, man-made oddities, a pit stop at McGinn’s Pistachio Tree Ranch will have the whole family chuckling. Alamogordo is also famous for the world’s largest deposit of white gypsum sand; 145,000 acres worth! At White Sands National Monument you can climb to the top of the dunes for a photograph and then sled down on a plastic snow saucer purchased from the park gift shop. The Trinity Site, where the first atomic bomb was tested, and McDonald Ranch can be found a mere 80 miles to the north. If you visit the site, keep your eyes open for blue-green pebbles underfoot: this rock is known as Trinitite and is still mildly radioactive. As of 2005, the amount of radioactive exposure received during a one-hour visit to the site is about half of what a U.S. adult receives on an average day. Sally, if you don’t stop pinching your brother by golly I swear I’ll turn this cararound and take you on that Radioactive McDonald Ranch Tour! 2012 is a huge year for New Mexico, it’s the state’s centennial! On Saturday June 16, 2012, Albuquerque will close down Central Avenue for this free celebration. Get your family party on in downtown Albuquerque as they celebrate Centennial Summerfest with dancing, food, music, car shows, art, and free children’s activities. 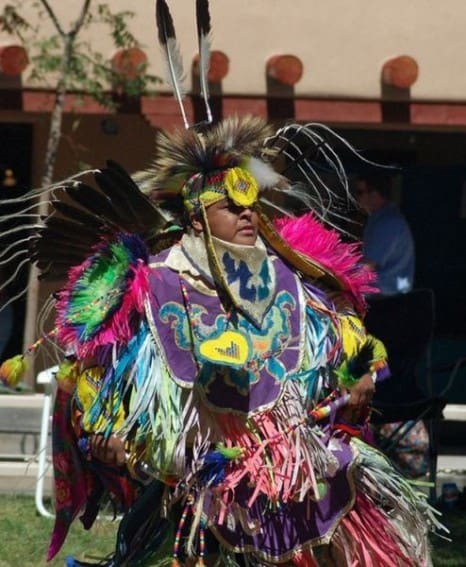 This block party will depict many of the important aspects of New Mexico’s history–and future–so that in one day you will get a taste of New Mexico’s past and what lies ahead. The day-long event will end with a free concert by the popular group, Los Lobos; this crowd-pleasing band will rock the night in celebration of 100 years of New Mexico Statehood. Now that’s what I call a party! Looking for more fun in Albuquerque? Read tips & reviews from other Trekaroo families.